mGinger Review – mGinger is an Indian site for Indian audience, that pays you for SMS ads you receive on your mobile based on your profile and interest. An Indian site for Indian audience, that pays you for SMS ads you receive on your mobile. You have to register on their site, and verify your mobile number. Based on your profile they send you daily SMSes and emails for which you get paid for. The amount is very very low for you to earn any significant amount. The rates are 20 paise (USD 0.004) per SMS you receive. If you refer a friend you get paid Rs 2. Apart from that you also get paid a recurring 10 paise on 1st tier and 5 paise on 2nd tier for each SMSes your network receives. Who Can Earn from MGinger? Theoretically any Indian who has a bank account can earn from mGinger but practically no one can make anything significant through mGinger and so according to me it is a waste of time. 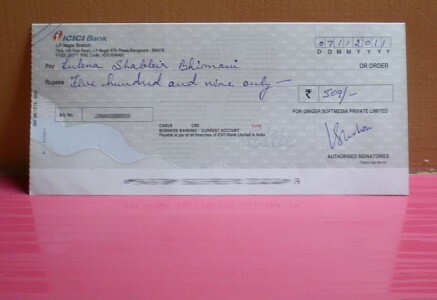 The minimum amount before you can request a check at mGinger is 300 Rs or (USD 6.5). My wife hardly uses the site and so she did not realized until last week that she has made more than Rs 300. Why my wife made a Payable amount? She has more than 1000+ people in her first level network and that is the secret to making a payable amount in mGinger. The reason she has so many referrals is because once upon a time I had an Indian site where I was using mGinger banner when I had no advertiser and that lead to lot of people signing up under her network. Currently she has Do Not Disturb or DND activated on her mobile phone and so she doesn’t receive any SMSes but still manages to earn few paise daily because of a very large network. If you are looking to earn some amount of money with mGinger, you need to make few thousand referrals.